Physiotherapists can identify the reason for your neck pain and provide proven effective treatment. Your head is heavy and balanced on a narrow support made up of seven bones called vertebrae. The vertebrae are separated from each other by discs, stabilised by joints and ligaments and moved by muscles. Because the neck is so mobile, it is easily damaged. Injury and postural problems are the most common causes of neck pain. Diseases such as arthritis or degeneration of the discs can also cause pain. 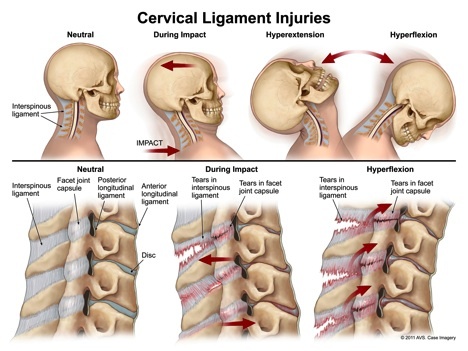 Neck injuries most often result from motor vehicle, sports or occupational accidents. Damage may occur to vertebrae, joints, nerves, discs, ligaments and muscles. A common neck injury is the acceleration/deceleration injury or ‘whiplash’ where the head is thrown forward or backward. If you are experiencing neck pain, it is important that you have your condition assessed at Cobram Physio.